I have a special video message – just for you – from Chapter 10 of A Confident Heart. In it I share about the power of knowing God by His Names and learning to living in the security of who HE is! Praying it will really encourage and inspire you today! Download video “Message Notes” in a notes in a PDF or in a Word doc here. Download and print an list of the Names of God – the ones I shared in the video and more from Chapter 10 in A Confident Heart. Last Week’s GiveAway Winner: Barb K. you are the winner of my “Come to Me” stress-relief gift pack giveaway which includes a Bath & Body Works Eucalyptus Mint candle, God-iva Dark Chocolate and an Chamomile Lavender scented Anti-Stress Comfort Wrap. 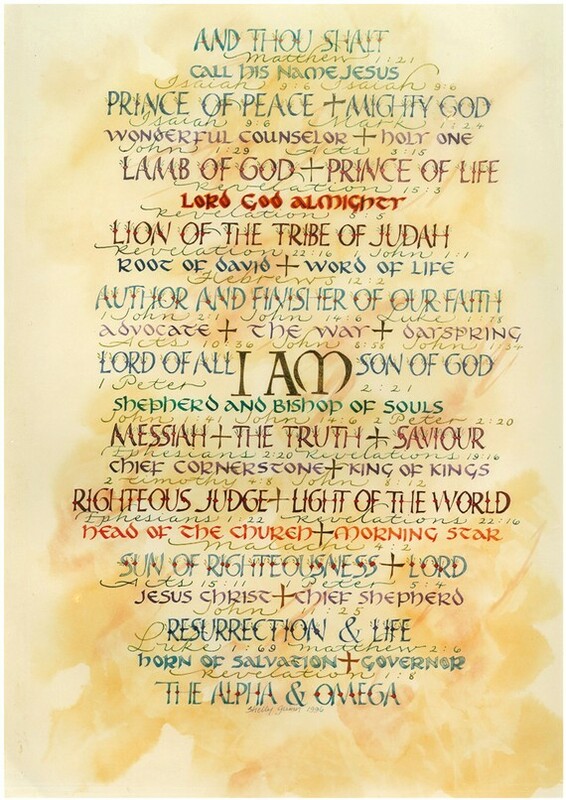 Names of God Giveaway: ‘m giving away 2 beautiful 5×7 prints with the Names of God by Shelly Ann Guinn. Enter to win by sharing your answer below in the comments. What did you learn in today’s video message about the importance of knowing God intimately and experiencing aspects of His character to build your trust in Him? Something that has really spoken to me is learning to turn my focus from myself to God. Choosing not to become overwhelmed with my fears and doubts, but, instead, focusing on God and His power, grace and love. I’m so thankful God doesn’t leave me to battle my fears and doubts on my own, but battles them with me and helps me to conquer them! I am encouraged to know that He helps me back up again when I fall. Thank you for your encouraging message! This chapter has especially impacted me in such a powerful way! how you need to depend on him each day,and how he helps the rightous rise up again. enjoyed seeing your video as always. I can relate to gideon. To know God intimately means to understand who He really is–what kind of a God He is, His character and His personality. Something I have learned in my walk with God is that I am not perfect at all and that there are many flaws in me. It was cool when you said in the devotional that becoming a Christian is not about being perfect but accepting our weaknesses and allowing God’s strength to flow into those areas of our life. To know God intimately is to experience the ups and downs of life with Him, to process life with Him and just as Gideon who was originally a timid man won victory over the Midianities and also became a confident and courageous man by overcoming His own personal enemies we too can become victorious over the challenges life throws at us when we know God intimately because He will be for us many many things according to His character–our provider, our Father, and the one who never leaves us. He will help us become more than what we could have become on our own. This is how I am reminded of his love for me, when speaking his name I feel a sense of comfort. I have only begun to learn the names and meanings from Hebrew references…but in this process it has taught me that even in record of Bible stories it is vast and without end the NAME…Thank you for sharing and for once again bring the Word to life! I think what I learned is that I will fall and it’s not failure but as you said in Chapter 10 we need to stop trying harder and start turning sooner towards the Lord who will lift us back up. For our strength comes through Christ and not through ourselves. This has been a really good reminder for me because I’ve had a difficult couple of weeks with depression and trying to fix myself and stop making the same mistakes. Now I know it’s okay to make mistakes, Jesus loves me just the way I am. “Following Jesus is NOT about us being perfect!….” What a tremendous relief it is to be reminded that our failures are just stepping stones to our ultimate goal. Every struggle and every tume we get back up, our faith is so much stronger than the time before. We learn that God will not let us fall! Amen….I will fail…I must not be afraid because I will fail into Jesus’ arms. That is what I call failing forward. Thank you for reminding us that when we fall we can get back up again and have the confidence of knowing God will be there waiting for us to turn back to Him. I REALLY needed to hear that today.God is so awesome and loves us so much. I often feel really bad when I’m not perfect in living out my faith and I hate it when I let God down by not being perfect but your message helped me a lot today. Thanks again 🙂 You are a blessing Renee. I loved today’s message!! It reminded me that I have to spend time with God so that I can truly get to KNOW and TRUST him. I am babysitting my 3 month old granddaughter, Nadalee. In her short life she trusts me–she knows that I am going to hold her, change her diaper, feed her, sing to her, play with her and the lists goes on. The other day my daughter (baby’s aunt) was holding Nadalee–I turned around and looked at Nadalee and she would not take her eyes off of me. She KNOWS and TRUSTS her grandmother the same way that I need to KNOW and TRUST God. To get to know God intimately and know who He really is and to believe that he knows me so very intimately and cares. I’ve been intrigued with the names of God and have studied them a few times I’ve found the names I remember most easiest are the personalities I’ve actually experienced for my self. I love all of His names but I think El Shadaai; the God of more than enough is my favorite. Yes we do fall, but by the grace of God we get up. For a saint is just a sinner who fell down and got up. I am learning to stop leaning on my own understanding but to step out in faith and to take God at His word. I am finding that the more I that I learn about His character and who He really is, the more confident my heart grows in trusting Him. There are several areas of my life that I have never seemed to be able to master or get under control, and those areas are changing right now due to my ability to see God first, rather than my fear of failure. In surrendering myself to who He is, I find that I am becoming more and more of who I was meant to be. My heart is overwhelmed with gratefulness, even watching your video…my heart just swelled. How my love and trust for Him is growing…my desire changing…just so thankful and expectant right now. More and more in love with Him! I did a Bible study a some years back about the names of God, and it was so meaningful to me, and I was reminded of that study, and all that is revealed about God through those names. I have always identified most with His name El Roi. We were told that it not only meant the God who knows me, but the God who knows us intimately, through and through, the good and the bad, and still loves us. Growing up I wanted that kind of love desperately. The love of someone who knew me completely, and who I could trust with all of my heart. I wish I had known more about God than I did back then, that He was more than a judge or Santa in the sky, bringing down judgement, or granting “wishes” if I was “good”. I wish that I had known about my FATHER in heaven, who loved me, who knew me, really knew me, and still loved me, and always would. That I could trust him completely, and He would always be there for me. I have been betrayed, hurt, and let down my so many in my life that trust is hard for me, even complete trust in God. However in the last couple of years I am learning, slowly to trust God completely, even after setbacks in that trust. This Bible study has really helped me with that, and in ways to do it, and reminding me today of His names, and how they are his promises that I can always trust in just keeps strengthening my trust in Him, and my resolve to trust in Him! Thanks Renee! Hi, Renee and everyone! I’ve written here before not in this post, but in others! Renee I was just feeling so discouraged a few minutes ago, and God knows just what to send. Your video couldn’t have come at a better time! i’m totally blind! I’m going for my g.e.d I’m 48 I did lots of research on the g.e.d. math is one subject that is on the g.e.d. test. I have a lot of problems with math! I need to go to the basic. I’m a quicker learner but with math, my brain doesn’t work! Anyway, my g.e.d. provider suggested to me to ask my worker at cnib if i could get someone to come and tutor me! She said they don’t do that! I’m only asking for an hour help! I remember in the past one of the staff, had students, and one student was helping me with anything I needed help in! now, I believe while we are waiting for people to help us, we should do what we can to help ourselves! That’s what God wants. I prayed for help in basic math. i googled the words on line basic math for free. I found a wonderful web site with basic math and other subjects, and I was able to hear short videos! on basic addition and basic subtraction! Just perfect! for what I was looking for! However, I still need that live help! Please pray for me! I was feeling just so discouraged! Then, I got your wonderful e-mail! and listened to your video! just what I needed! I asked God to help me trust him. I don’t want to feel discouraged but I do! i love Joyce Myer, she has a new name for the enmy joy theif! GOD BLESS YOU! I pray that you will be able to get a live math tutor… Math is my weakeness- numbers and me don’t jive. I pray that you will pass your GED Phyliss! Love, love, love the reminder that though we will fall many times, we will rise again, with God’s amazing grace and help. I love to visualize as always, Jesus walking alongside me, even holding onto my hand so tightly when I need to feel his Presence with me……also, when I need help getting back up when Ilve fallen, I see Him reaching down to pull me up! In my life, I’m so guilty of trying to do it all on my own, in my own strength…..til I wear myself out completely! I have come to learn and depend on God so much more, and see how he takes care of us. I am so grateful for His strength that makes me stronger! The more I depend on, and go to Jesus, the more I know Him and feel comfortable going to Him. It is just like any other relationship. If you put in the time and effort, you will reap the blessings! I love the story of Gideon……what a totally relatable story!!!! And loved the names of God, which I plan to study out more closely next!!!! Thanks Renee! For me trusting God is hard at times. When trials seem to never end or another one comes on the tail of the first. But with each victory he shows me how much he loves and cares for me and as I come through the trials the battle scars he uses to build my trust in him. He shows that he and he alone can comfort me during the trials and bring good things out of those times. First of all, a question to Renee and all the readers out there. Did you see any strange translations at the bottom of the screen during Renee’s message? The whole thing at the bottom of the message kind of threw me off from your message Renee. Will somebody else please confirm they saw words that Renee was NOT speaking?? After going back over the message, I started to think about how much easier life is when I don”t take myself so seriously. God did not make me to be perfect so it’s ok when I mess up as long as I don’t get all caught up in what others think about me. It’s ok with God it I fall sometimes b/c it gives me a chance to rely on Him. I know He will always be there to help me when I call on Him. My Lord is always my Savior…my favorite name for Him. At what time marker? I watched it again and didn’t notice any strange translations?! nope I didn’t see any strange translations? It was the strangest thing. When I watched Renee’s video the first time on my Kindle it showed on the small square instead of going to the entire screen like it usually does andyhere was arunning comentary at the bottom. It was like there was a second commentary mixed in with hers. Of course now when I came back to view it again it was just as it was suppose to be. Guess it will be an unexplained moment in my life. Thanks for responding to my appeal. A confused but still confident woman. Thanks Melissa May for responding. That was really strange wasn’t it? It didn’t do it when I watched it again. I never thought about closed captioning but your description was perfect. I read what you said in Chapter 10 that we need to stop trying harder and start turning sooner towards the Lord who will lift us back up. It is so easy to try in our own strength. I don’t know if i know how to totally let go and let God. Total trust seems to be a very hard thing for me and i’m not really sure why. I have a really hard time going deep into myself to get to know me better. I think that’s why i don’t journal. I write poetry and sometimes my heart starts to show just a wee bit in my poems but that’s as far as i get. Anyway, i’m trying and i love this book so much. I am getting a lot out of it and i’m so grateful for your honesty and encouragement Renee and all the others who comment on here. What I learned in today’s video message about the importance of knowing God intimately and experiencing aspects of His character to build my trust in Him is He is who He says He is. After we did this chapter in the last study, I printed out the handout you had on the names of God. I say them aloud every morning to remind myself who God is. My favorites are Emmanuel – my God with me, Abba – father (probably because I never had a father), and El Shaddai – the all-sufficient God because He is all I need. Thank you, Renee, for reminding me who God says He is. What I took away from this lesson is that God loves us and will never forsake us. He will continue to pick us up and put us back on our feet time and time again. All we have to do is trust that he will. There have been many times in my life that I have had to learn this over and over again. The wonderful thing about it though is that our Heavenly Father loves us unconditionally and all we have to do is ask. Ask and ye shall receive, believe as though it is and it will be. Praise El Roi! I learned to stop trusting in myself because when I do that and fail I am devasted and beat myself up for not doing better or being better. I have a tendency to try and do everything myself. I also so want to please God and in doing so, I put too much stress on myself to not mess things up and when I do I feel like such a failure not only to myself, but to God, which I know isn’t true. Your post and the reading of Gideon and the righteous who will fall spoke to my heart. I really liked this post and it struck a chord in my heart. Thank you, Renee! I learned from this video that I need to depend on Him and to know He is dependable. I also need to trust in God as we come to know Him in the way He is described in the Bible based on His character. I am like Gideon in some ways – I need to let go and follow God more consistently, by totally depending on Him instead of relying on myself to tackle my earthly problems. Like Gideon I need to shift my focus from self doubt, and helplessness to believing in Abba, El Shaddai, Jehovah Jireh. Amen! Thank you Renee, and Thank you Sisters- I love reading all the comments- it holds me accountable, and it enlightens me! Thank you for the words of encouragement that I needed to hear. Even though I have been a redeemed Christian for over 30 years I still struggle with knowing God and trusting Him completely. I want to do things in the flesh and I cannot seem to be able to seek Him first in all aspects of my life. People may see the outward appearance of a Christian woman,but I know my life is not totalling how it needs to be. I deal with so much doubt each day as a wife andmother. Thank you for your book where I can find some hope in becoming a confident woman. I too have been a Christian for over 30 years. I feel like I am just now getting to know God for who He really is. I also have difficulty in trusting Him completely & seeking Him first in every aspect of my life. Thank you for sharing from your heart. It touched mine. Unfortunately I’m at a point the last week or so that what I am reading is not sticking. After watching your video 3 times I still can’t retain what I read. Like you have shared in parts of your book, sometimes I feel like I am losing my mind! The last month or so I’ve also been struggling with my faith, I’ve been praying and have other people praying for Healing in my almost 7 year old niece. She has already had an operation to remove a tumor in her left ovary, now the oncologists want to remove the entire ovary and tube. This is my brothers oldest daughter and he and his family are not believers; I live 3 provinces away. Some days I fear that my faith is not strong enough to heal my precious little niece. KAREN DRAW CLOSE – DON’T GIVE UP…you are precious and you are loved. This video really spoke to my heart tonight. We had a service tonight at church… and I was asked to sing. I love singing, but in front of lots of people… not so much. Tonight I hadn’t practiced this song at all before service that God had laid on my heart. I hadn’t practiced it with the woman who plays the piano, and in fact didn’t know if she even knew how to play it. But God showed me tonight, that just like you said… when I put my trust in Him… his strength is made perfect in my weaknesses. I was a nervous wreck, but I know that God was my source of help and strength tonight… and I am learning to start boasting and glorying in my weaknesses… for the power of Christ will rest upon me. I will glory in my infirmities, my weaknesses… cause that’s when God’s strength and power is made known even more to me. I give God all the glory. I thank Him for this chapter… and for this video. Sometimes doing God’s work isn’t always convenient or comfortable… we just have to be willing… and step out of the boat and let God do the rest. I thank God that he is so much greater than me. I pray he rids me of myself… and let’s his glory and light shine bright through me! I’ve realized that nothing makes sense if I don’t KNOW God. I am unlearning so much because I’ve had wrong assumptions and images of God. Getting to know Him makes me thirst to know Him more and see how He truly sees me and what He wants for me. It is life-changing! Hi Renee, what struck me was when you talked about knowing God as in knowing Him from reading the Bible about Him~~~but knowing Him as He works in your life is knowing Him intimately~~~trusting Him to help you through the day~trusting and praying to HIm to help you as you watch someone go through cancer~~~going to Him before anyone else~~~knowing He is in control of events happening good or bad~~~and through all of this thanking Him for the good and bad in your life. As I go through helping my son recover from surgery from crohns/colitis and get off drugs that are addicting and try infusion after infusion that dont work and knowing God is with us as we move forward and knowing He does have a plan and thank Him for the way He has moved in our trials, sometimes not our way but knowing He knows more than us and can see the future we know it is His way. He shows us His loving side as we move through our trials and hold us in the palm of His hand, because He is our help we sing in the shadow of His wings~~~all He wants is us. Thanks for the list of names~they also are in my purse to read. It is so awesome that God met me right where I am this last week.Everything was so spot on where I am right now It’s like you were looking into my heart and knew my exact struggles. Obviously it is God Who sees my heart and Who led me to this study. He knows me inside and out and I need to take time to get to know Him better. I need to stop trying to do things on my own and just trust what He says and what He’s already proven Himself to be in my life. I am going to go back and read this book again and again as many times as it takes. for these truths to sink in. I am learning that we need to depend more on GOD, trust more in HIM… and quit the worry trap… I know it sounds like I got it down… but I just typed it… now I have to convince myself and really believe it… God’s plan for us really is easy… we make it difficult… but I like the parts about getting to know Him in a more intimate way… really getting close… i just love the videos…. Oh how this Chapter has touched the deepest part of me! I am so thankful that God lead you, Renee, to reveal this angle of study on Gideon. God knew what Gideon needed & at each step graciously and patiently provided! YEAH! As I shout praises to GOD…YEAH. At every step…GOD graciously and patiently provided & not once made Gideon feel inadequate, like a failure or grew tired of the lack of trust in Him. INSTEAD, He walked with him to the point of confidence and unwavering trust. God knew that His works, and actions would bring glory to Him through Gideon! …And today the Living Word of God continue to reminds of His amazing works. God settled me to read this chapter during the lengthy absence required to care for my mother. It was with GREAT confidence that we all acknowledge(d) God’s work in bringing my parents here with my family during illness. When the task became more daunting than expected (loosing my father, repeat hospitalizations for mom, as well as my own family) I have questioned MY abilities…NEVER God’s plan. I have felt so inadequate to fulfill the roles that He’s called me to. My tank has been so depleted that even getting a reserve is a struggle. Yet, He is faithful. He placed me upon the heart of a friend and she called me today! Because she did – He sent confirmation that HE IS ALWAYS NEAR! Because the solution is outside help…doesn’t mean that I have failed. What it means is – be smarter and recognize the blessings aren’t always wrapped as expected. I will not be the wife, mother, daughter God has purposed me to be trying to balance it all on my own. As I get in place for in home non-medical care for my mom and daily programs for my children, please lift in your prayers for the $$ to provide the care that is needed for each family member in our home – until God brings us to that next place. And the big reward…thanks to her, my husband and I will get a date night on Friday. I am so amazed at the continuous blessings God showers over my life. God’s Grace Given to1… and so thankful. As I watched the video this morning, I kept being taken back to diffferent lessons we have had through out this study. Not only is Ch 10 about knowing who God is, He has been using this whole study to reveal Himself to me. For example, in Ch 4, He didn’t have me focusing on things that happened to me when I was little or newly married, but focusing on how my love and trust in Him had been misconstrued. Every page has been about learning to see Him differently, seeing Him for who He is, seeing how the enemy had twisted my perception of Him. So thankful that I am finally getting to know my Father and even more thankful in knowing He loves and accepts me just the way I am!! I love the list of names and am looking forward to getting to know Him more intimately as He reveals Himself in each one of them! What have I learned from this message? I learned that I CAN get back up – that I don’t have to live in fear, that I don’t have to live in doubt, and the way to do this is to become closer to God, to rely on him, to TRUST HIM. I have had a lot of doubt these past couple of years. There was a time that if anyone would have asked me if there was one thing I didn’t doubt, what would it be – my answer would have been that God truly existed. However, 2-1/2 yrs ago, I lost my son. He was 27 years old. Two and one half weeks later, my other son ( The identical twin brother of the son I lost) was in a car accident in which he fractured his first 2 vertebrae in 5 places. He was on life support, and I almost lost him too. Nine months later after doing surgery on my sons 2nd and 3rd vertebrae (to put a plate in and align the two), he was lifelined back to the hospital (2 days after the surgery – they let him out the day after the surgery) and again, he was on life support, this time for 11 days, and again, I almost lost him too. In between all of this, I lost my job and was nearly homeless. I still struggle today with they “why’s” and with doubt, but lately, I have been fighting my way back to Jesus – and when I say fighting, that is what it has been – a fight. I am determined to run the course – to fight the good fight, to no longer doubt, to once again rely and trust in The One who can help me with these struggles. I found this website not too long ago, and have been reading some of the Bible verses, the Bible studies, and watching the video’s. I hope to be able to order the book “The Confident Heart” soon. This has truly been a blessing for me. Thank you for this video. I needed it this morning. Was doubting myself over the way I handled a situation this morning, not sure if I let God lead or if I stepped in His way. While you were speaking I had this picture of a child on the ground & Jesus reaching down to help her up. Thanks for reminding me that God is with me, He is there for me & I can trust Him with my life – even if I do step in the way. Thanks for the video! I have been withdrawing from God lately and this was a good reminder that no matter what I do, He still loves me. I printed out the Names of God and will carry them with me as a reminder that He is holding me up and will see me through the happy times and the tough times. Renee, thank you for being so faithful to His speaking to you so you can share with us. This was an amazingly powerful message. Just last night at a women’s ministry meeting we talked about having a love affair with God. Putting Him first in our lives and seeking after Him above all others. Learning what to call God has to be the most empowering thing for me right now. I call my son Caleb. He knows when to answer to His name. How much more can we call out the name of God and have Him draw near. Psalm 9:10 really spoke to me today. I am learning to trust God more and now I know His name. He has never deserted me and I am so thankful for that. Thank you Renee for your heart felt words today. god is using them to do mighty things. For me, if I can remember it is not the person, place or thing I am struggling against, it is in fact the devil himself, I think I would be less likely to try and take him on alone. I would be much quicker to turn to God for His help. You reminded me that it is not about trying harder, it is about turning sooner!!! WOW…That is my prayer and challenge for this week. I get moving through life, hit road blocks, attempt to take them on in my own understanding and the next thing I know I’ve become DEPENDENT on my own strengths. Please God help me to become more IN-DEPENDENT upon YOU!!! Thank you again Renee for sharing a message I needed to be reminded of. Learning to replace doubt with the names of God will remind me of all the times he was with me and providing for me in the past. He is the same yesterday, today, and always. I love this book. Thank you for sharing your heart with us. I am learning so much. To God be the glory! It is good to be encouraged to know God by name and to call Him by name. Learning His names, like learning His promises to us, and calling on Him by name and repeating and praying those promises keeps me on a more even keel, because I am relying on His words, not mine and not allowing my emotions to overwhelm me and knowing that through Him, I am an overcomer and I am His beautiful, cherished child. His love trumps my emotions every time! I loved your enthusiasm and obvious joy, Renee, in knowing the names of our God. I am going to set the goal of learning those special names of God, so that I can have that same confidence and joy in my Saviour!! I will be making several copies of the list you provided and placing it where I will see it, read it, and be able to start memorizing it! Thank you!! We all fall short, yet we are too hard on ourselves. We need to remember that He is for us not against us. His grace is sufficient and extends unconditionally. Thank you for the reminders that life isn’t about us, but rather turning towards Him. From this video, I am reminded that I am too hard on myself. That He has forgiven me of all those big mistakes I’ve made, and that I need to do the same. I’m reading and journaling and praying daily and still struggling with feeling His presence in an intimate way. I like the statement in Chapter 10 that said, “God used Gideon’s “why” question to draw Gideon closer to Him, because His answer shifted Gideon’s focus from hard things that had happened in his past to what God was about to do in his future.” God has used my “why” question this year to draw me into a stronger relationship with Him. A year ago, I allow satan to cause me to doubt God’s healing power and place my focus on the problems at hand… BUT GOD brought me through pain and doubt into a stronger faith/confidence in Him. I have been thinking about all the different names for God lately. It is a great reminder of all the different ways that He is there for me! I just completed writing a goodbye letter to someone I was in an unhealthy relationship with and immediately afterwards I opened the word doc of the message notes with the words of ‘getting up again’ and how the righteous will rise again. This gave me so much TIMELY comfort and reassurance from Christ that I made the right decision and although it was painful to say goodbye and I feel like I fell down…that God is holding my hand and if I press into Him; I will stand again!!! God is such a wonderful God and it makes me feel so great to know that I can go to Him at any time about anything. He is ALWAYS there for me. Because of who He is, I don’t have to be afraid of anything. I love the fact that whenever I make a mistake God is faithful and will forgive me for whatever I have done. God uses ordinary people just like Gideon everyday and like Gideon I want to be used by the Master, after all I am God’s unique work of art still in progress. So timely for me…Especially the Biblical Scripture the Righteousness will fall seven up and will rise again. That is totally how I feel lately. Something good happens then another obstacle. Boy also asking “why God can’t just put it in right in front of my face. On top of being laid off twice, dislocating my elbow, now yesterday got a speeding ticket going to therapy. I just feel everything is falling apart but with the righteousness will fall 7 seven time and get up..It has helped. On a brighter note I’m allowed to Zumba again but of course take it easy on the arms. Furthermore, I went to about 20 minutes of Zumba last night in the hallway. They have this devotion and here is a video on youtube. http://www.youtube.com/watch?v=N8FUV9nS4 it’s called they Money tree. It means when life seems drowning to you. Dig deep and look for blessing. Cultivating a Heart of Gratitude. Sometimes we are blind to see the blessing in front of our eyes. God is with me every step of the way. I can depend on Him to guide me, to help me up when I fall. His promises and His grace build my trust in Him. By learning His names I see again all the wonderful ways God is with me always. He sees me, He is my strength, my provider,my banner, He is faithful and graciuos. God is really all things. I want to live in dependence on Him. Wow, powerful like always. So much here. Guess if I pick one thing it would be that victory comes through dependence on Him. Facing my fears is not something I am good at, but with God’s help I will allow Him to use my doubts & fears to make me into the confident woman He intended me to be. What resonated most with me as I watched the video was the feeling that God is always with me and I don’t have to do it (whatever “it” is ) alone. He is there. I limit my power and abilities by trying to do everything myself. If I would just relax into God’s strength and power, things would be so much better, easier, etc. I need to trust him more and more…walk by faith & trust. It is easily said…but carrying it out is not a one time statement. It is lived and worked out continuously moment by moment. Please God help me to rely and depend on you always. I was struck by Gideon’s story. Gideon was afraid and in hiding yet God said, “The Lord is with you, mighty warrior.” It hit me that God saw way more in Gideon than he saw in himself. I’m in the midst of some major transitions and find myself afraid to continue on. God sees the same in me….I’m afraid, I don’t want to continue through this journey of change, yet God tells me He is with me and sees way more in me than I see in myself. I’ve also been trying to find some magic formula to help me during this transition. If I just prepare myself more for moving or getting married…this change won’t affect me as much. I felt like God told me this morning, through Chapter 10, that the formula is a deep dependence on Him. Meeting with him daily, telling him I’m scared, and letting Him guide me through this next season of life. I don’t have to have it all together, He’ll have it together for me. He’s patient with my doubts and will be with me today like He has been in the past. Renee: This study has been such a blessing to me in this season of rejection, conflict and change. The names of God are a tremendous help to me and I have been incorporating them into my prayers regularly. I feel that God wants me to meditate on His names. He brought me this message of His names through your message and then from a radio message from a pastor I listen to while exercising. I am going to print out the names and keep them with me and share with other. I’d love to have the artwork to put at my desk in my home office to remind me of who He is. May God continue to bless your ministry. I am a little delayed in adding to the comments for your video session this week. I have watched it four times because i felt the message you gave was so important, for me, but also that I could absorb the truths you shared to pass on to others. In my life i have learned the hard way, ‘ even though I may fall seven times, I will rise again’. The love and grace of God have never ever failed me. Just as you said, the struggles that I have experienced in life have helped me to be stronger and conifidence is growing. The list of the Names of God have truly blessed me over these last few days, the sense of who God really is and how this can impact my life as I get to know Him more. Thanks for your faithfilled video message. Renee, thanks for your video message. Trust in the Lord with all my heart, and not seeking my understanding has helped me calm my fears and struggles with the challenges of life …. Teenagers,work,ect…. But God is good and he will bring me what I need as I pray for his help . Thanks again Renee! I have been a Christian my whole life and I thought I knew God from all the religion classes, memory work, and homework through 12 years of parochial school. How awesome in this season of my life I have begun to start really knowing my God. You hit the nail on the head that to begin really experiencing God is to see God come alive in my life. To see Him as the God who healed me through medical problems. To see Him when I feel alone and feel His presence. When I feel fearful and full of doubt to pray and feel Him giving me confidence! I have so far to go but to see the depth my faith has grown over the last 6 month is nothing start of His presence! I’m almost giddy with excitement to see where He wil take me as we walk hand in hand! I learned that knowledge AND trust go hand in hand. You can have all the knowledge in the world but w/out trust those words won’t have the same impact!! I took a terrible fall several years ago and I can STILL remember what it felt like to be hurling headlong over the sidewalk and onto the pavement below. So, when I read the passage in Proverbs from the NAS I had a visual image of that fall. I appreciate that verse all the more. I’m thankful that I don’t have to stay down on the pavement because my El Roi and Jehovah Shammah are there and will help me get back up!! PTL!! That He is there in all of my paths of life!! That verse from Proverbs? That though the righteous fall they will rise again? I haven’t noticed it before. Lately I’ve been feeling like I’ve fallen but that I can’t rise. I know it’s a lie but my confidence in who I am in Christ seems to be escaping. I have your book now and I’m looking forward to sinking my teeth into it soon! So important to know God’s word so that when these lies come I’m able to fend them off by His Word and the power of the Holy Spirit. I’m thankful for your post today. No Matter what the circumstance, God is always near. He hears your prayers and answers. It may not be in your time, but He will answer. It may not be the answer you want, but He answers. We need to always trust that God knows best and He will always see you through whatever the circumstance. And when you trust Him, He will surely give you the disires of your heart. I loved learning about these names of God. How powerful! I think my favorite is Jehovah Shalom – The Lord My Peace, but also love El Shaddai (there is a beautiful song with that name, maybe by Amy Grant?). I have always loved Abba Father. I learned this week to continue to count my failures as joy, because God is using them in my life to teach me and mold me. I took away from this not only the importance of being specific with my prayers, but calling out to God specifically His name. I also learned to pray my doubts to the Lord and where I am struggling. That He loves me and the fact I am coming to Him when I am uncertain and asking Him to show himself and the way. It reminds me how concerned He is with every detail of my life and how much He loves me and loves me seeking His will. There is a big difference between knowing God… and really knowing Him. What I mean by that is… as a young child, I knew there was a God. I even knew that He loved me… but I didn’t know Him. It wasn’t until I was in my 30s that I truly began to seek God, to know Him and love Him. I still have rough patches, times when I’m not sure which direction to turn, but knowing that He is allsufficient, my provider, my redeemer, the Great I AM… makes all the difference. I would love to get a copy of this beautiful peace to be able to learn the names of God,or maybe share w/ a friend!! My word for this year is TRUST. I was reminded once again to trust him more. To stop fighting against myself and to accept my weakness and to totally depend on God. To trust him. To trust him more and more. Changing the focus from the weakness to the area of struggle and how we can become stronger as we release this area to God and trust him. Release and receive. God has been reminding me that he is EL ROI the God who sees. That he my heavenly father, the creater of the universe sees and know where I am and what I am going thru. And once again challenging me to trust hime for he sees. I would love to have the copy of the names of God to hand on my dining room/office wall so that I can be reminded of who he is to the Glory of His Name! When we take our eyes off US and put them on the Lord, we become stronger; and we begin to trust the Lord even more each day. I receive the message of if I fall 7 times I will get up again. 9 weeks ago I was thrown from a horse and shattered a vertebrae and injured two discs in my spine with a large fracture piece pressing into my spinal canal. I have had to lay flat while doctors try to figure how to fix me. Im allergic to pain medication as well. Yet, today as I listened to your video I realized some of the names of God I did not know, where who He has been to me through my journey. Prayer, praise and His presence are my pain medication. Though how I got to this place would not be my first choice (nor staring at the ceiling for sure) I can honestly say how amazing the gift and revelations of truly learning how amazing and loving God is and how wonderful every moment can be with Him far outweigh the negatives. From the furnace of affliction He has brought me to a wealthy place. The doctors opinions vary of whether I will walk when done, but I know that I am Healed because He is my Healer and I will run and not grow weary and ride horses again, however He chooses to heal me. This I so love about My Father He loves me and never leads my side and that He is no respecter of persons, what He does for me He will do for all who ask. Some times life seems to big, to complicated, to difficult. But God has it all in the palm of his hand! Quit focusing on how big the problems are and focus on how magnificent our God is. Matthew 19:26 Jesus looked at them and said, “With man this is impossible, but with God all things are possible.” What a marvelous promise! Keeping my focus forward, God has a plan and I trust him with all my tomorrows. Like Gideon, I could see what I couldn’t do. But God came along and shared his confidence with me, gave me a new direction and has lead me to victory. My confidence weavers some days, but God is faithful. He never expects perfection, all He asks is that we trust him. Amen Renee! As a woman in Christ I need to have confidence through Him. Fully knowing & understanding that I will fall, but need to seek Him just as soon as I do. The Lord this past year has shown me how very important the power of forgiveness is. Not only forgiving those who have hurt me to the point of deep emotional pain, but that I must also forgive myself. Not a single one of us is perfect, yet Christ died on that cross for each and every one of us. Why, then if Christ could do something so selfless, is it so hard for us to forgive, and yet, there is so much power in forgiveness! This is something I remember each and every day. Christ is so full of Grace & Compassion, I can only try to do the same. We are meant as a vessel of Christ. Be more like Christ. When you fall, get back up with Christ as your strength. Amen!! Thank you for the reminder that GOD is all I need. He IS sufficient. I think that as we get to know God in all the different ways that the names described our relationship becomes more intimate and we spend less time “down” after a fall. Because we can be confident that God is there no matter what. Satan wants us to stay defeated but Christ offers us a VICTORIOUS life! The reference to fear in Chapter 10 really spoke to me…I spend a lot of time saying “what if this happens….” fear is paralyzing at times. Your story of being home alone and conquering your fear gave me hope and inspiration in areas in my life that I am paralyzed by fear. God Bless and thank you for this study. The names of God are such a comfort in time of trouble. This is a beautiful poster. When we more fully understand the character and substance of God, which is revealed in part through his various names and descriptions, then we can begin to know him even more, and delve into his love. Each of his names reveals part of his character and part of his nature, and we can call on those names when we are in trouble. Jehovah Jireh, my provider, is one of my favorites, and also El Roi, the God who sees and knows what is going on in my life and cares deeply about all my concerns and fears. How can we not love and respond to a God like that? I’m pretty hard on myself, and don’t really give myself much credit for things I’ve accomplished. God has blessed me considerably, but whenever something happens, and I fail, or fall, I think what a loser I am. God has always been faithful to me even though I have not always been faithful to Him. Hi Renee!! Thank you so much for the encouragement shown in your Confident Heart study..The verses are so encouraging!! So often times I have felt that GOD could not even listen to the least of my prayers or pleas for my family, loved ones and friends prayer requests. But one day when I was really needing encouragement at my job, I thought, GOD, I would just love to hear just a “word” from you now…..then over the office radio came a song by Rod Stewart, which goes, “Have I told you lately that I love you???? ?…..I listened to that song and the words just reeled in my head…a “secular” love song, but the WORDS seemed to be from GOD HIMSELF!! It lifted my day up…. I hope it lifts yours, too!!! I think this is my favorite video. Loved all the scripture references especially His promise in Psalm 37:23-24 ~~ “The Lord makes firm the steps of the one who delights in him; though he may stumble, he will not fall, for the Lord upholds him with his hand.” What an amazing promise I will not fall because He upholds me with His hand! Love that and can picture God holding onto me ~~ sometimes by the hand, sometimes by the collar, and always by the heart! Hi Renee/all: Thanks for the confident heart, blog, video etc. It helped me in my recent job transition. Now, I ‘d like to know how I could help a 32 yrs old bible teacher. He knows the bible inside out; & young & old enjoyed his bible study . He taught for a couple of years. Most recently, his girlfriend of 3 months, broke off with him.. When we asked why he was not teaching bible study after a regular break, he said (quote) “I dont like most of it- full of fables and false hopes. I get nauseas thinking about it.. & about Jonah-Its probably a fable bc people cant survive in a fish” . Is there a confident heart for man? He is our dear brother, who has lots of head knowledge of Jesus, prayed amazing prayers & has helped many in their struggles. Now he is crying out for help & I don’t know how to help him. Other church guys could ‘t help him also. Please, if you have suggestions, let me know how to help this guy who has fallen into the pit? I am also afraid he might bring others down with him also. Thanks for your help! In the beginning was the Word, and Word was with God, and the Word was God. And the Word was made flesh, and dwelt among us, ( and we beheld his glory, the glory as of the only begotten of the Father,) full of grace and truth. WOW!!! Praise God Thank you Lord for showing me the truth and leading me to you!!!!!! Please Pray for me I am going through alot right now I am soooo trying to keep the doubts out of my head I know I have to truly give everything to God just having a hard time getting myself out of the way!!! Right this very moment, I am so very discouraged. I am completely thankful for Jesus and grateful for having the Holy Spirit in my life. God has done wonders in me. So,, why do I continue to struggle? Struggle with trusting others, struggle with relationships with women. After all, I am a woman!! The stress at times gets the very best of who I am and leaves me so desperately wanting to just run away. As a single mom of 4; 2 who have grown and moved on yrs ago, and now with two teens still at home (13 Boy – 17 girl) ,and a new grand baby girl, only 5 weeks old’, a precious blessing from my 17 yr old daughter. Sigh….my daughter, who is she? I don’t know her anymore. I grieve the sweet young girl she once was, only just 2 years ago. So much has changed in her. For the most part, I handle these things quite well and in stride. Lately, that’s been challenged to the utmost. I know my bible verses which instruct me to place it all at the foot of the cross, and leaning on Him in all things, and I do, today…well more like these last few weeks,,,shesh,,who am I kidding, these last 2 years have taken their toll on my heart. Including my relationship with God. I no longer attend church or teach Sunday school, no longer am I assisting in video production and VBS designer,nor Sunday School decorator and sadly a year has passed since any involvement in church. I miss it so so very much, I long for it, and I believe it is where I should be, but <– (there's that 'but',) I have lost trust in the leadership. And I am completely longing to return to worshiping,praying, and surrendering to where I know I should be; truly something is keeping me from there. Is it me? My confidence is low; and not one person in my life would ever ever see that in me. I have been so good at being a strong encourager in others,and stable minded friend, it sure is a tough job keeping that stiff upper lip and putting on a happy face. I admit, I am feeling pretty needy in my day, today. Ya know, sometimes, just a hug and wee bit reassurance as a mother, as a friend, and above all, as a daughter of Almighty God; who I adore as my Father. Sometimes, it really does make all the difference to a gal like me. May I humbly ask for your prayers? thank you dona from honolulu for your encourageing words! It is hard to stay encouraged sometimes,! This is online classes I want to take with Liberty university, They need me to do my g.e.d. because I didn’t finish high school credits. math is on the g.e.d. test. It will take me forever! to study for math! First, I need to understand the basics before I can go on! I’m praying about this! I’m only studying the bible! and i think it’s silly! that I have to go through so much! It’s crazy! I’ll keep praying for people to understand they need to be more helpful! But donna thank you so much for your encourageing words. This is the first time ever anyone has responded to my comments in this course! Renee, thank you for your videos lessons and words of encouragement. Each day is one day closer in a relationship of the Lord. Yes I am a child of God and yes he knew me long before my birth, I just long to be closure to him. I find that my days are encouraged by songs, scriptures and knowing that if I fall or fail, the Lord is there for me to help pick up the pieces and to move forward. I know deep in my heart that the falls are there to bring me closure to Him and the help teach me to walk closure with Him. Some days I just like to walk on the beach, for with my footprints are His for He is with me. I seem to being having some hard days, where I continue to doubt myself (for instant: when I ask why? or I am not cut out for this type of work? Why do things happen this way?) I have always been an uplifting person for others and I put on a smile no matter what is going on in my life, so really no one knows if I am hurting except the Lord, and I tend to be really hard on myself when I make mistakes. So your lessons and verses have helped me.So now I will add the names of our God, for when I more fully understand the character and substance of God, which is revealed in part through his various names and descriptions, then I can begin to know him even more which is my true desire daily. Thank you again, Renee for your ways of encouragement, thru the Lords words. It can alone help to reduce your hunger or appetite and increase your body metabolism and create unnecessary complications for you. inches from their body. When your metabolism is speeding up your metabolism.